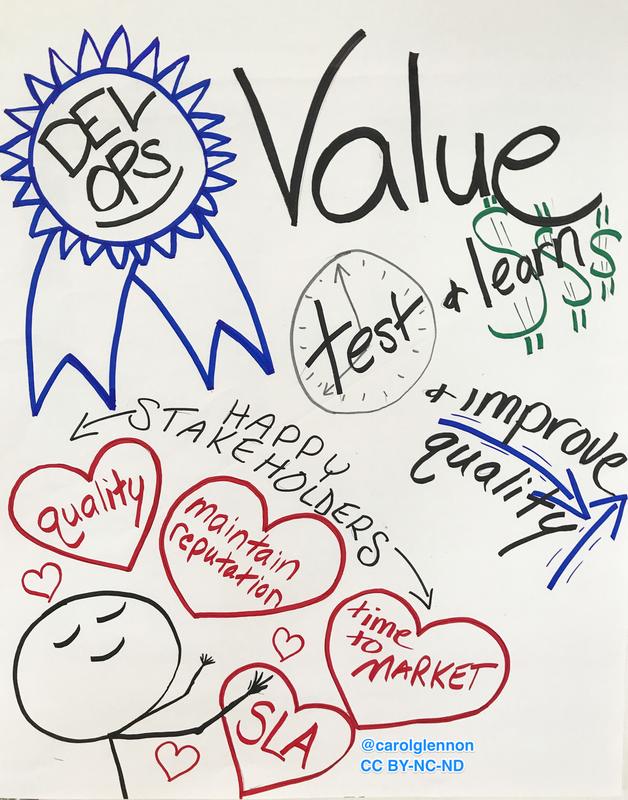 Get ideas about ways to supercharge your Definition of Done with DevOps best practices. It started with a little sign and an elevator pitch for a DevOps OpenSpace at the Scrum Alliance Global Scrum Gathering. A few hours later we had taken over a conference room to discuss how Scrum teams everywhere are working with DevOps. The biggest take-away from our discussions was that DevOps tasks and people are are getting involved with Agile Scrum teams more than ever before. Some scrum masters recounted how former development-only teams had recently begun taking on DevOps tasks and some of the Product Owners are now using Service Level Objectives in User Stories. What do chocolate and DevOps have in common? The talented @danapylayeva explained how they come together as themes in her book Introduction to DevOps with Chocolate, LEGO and Scrum Game. Her book helps teams to simulate and solve the bottlenecks in their delivery process flow using DevOps methods and processes. The group also loved how Dana’s team approaches DevOps mindfully, they have a “Red Hot Rotation” for every sprint focusing just on production issues and DevOps stories. Will your team be starting a Red Hot Rotation next Sprint? Several audience-members said they would be! Wouldn’t it be great if we could have teleported everyone to the OpenSpace? 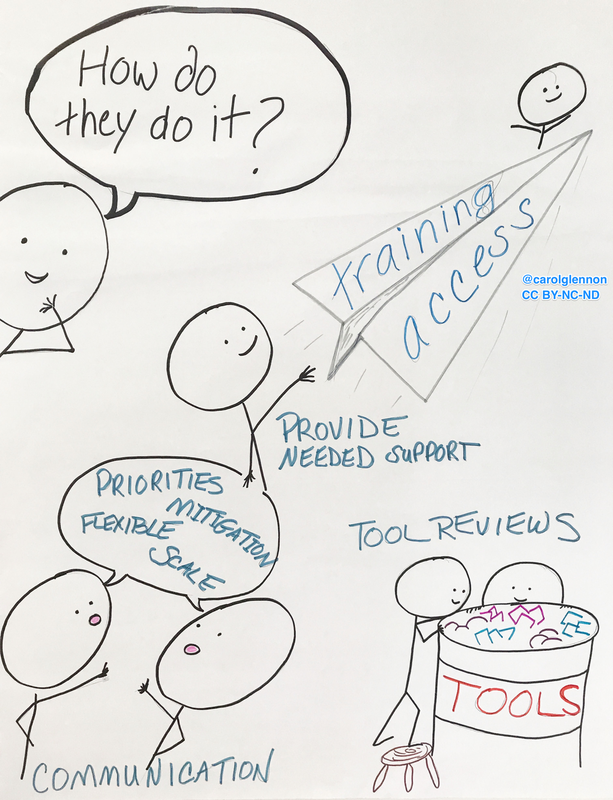 That feature is still in beta but we did save the flip-chart thoughts, ideas and conversations that were shared that day and they are posted below. Scrum teams can benefit from adding DevOps tasks to their scrum sprints. By recognizing and completing DevOps tasks in sprint teams can be more prepared for shipping code and release faster in an Agile way. In speaking with scrum teams preparing to add DevOps tasks to their scrum sprints I've been asked about what types of tasks might be commonly expected or what questions are good to ask. This is an intro checklist/discussion starter to help get some DevOps tasks and topics on the table during Sprint Planning, please build on this list and make it your own depending on your customer needs. 1.) What are the environmental resource needs of the Sprint's output on production? Memory? Compute sizing? Mirroring? 2.) What are we doing in this Sprint that might impact other services? Are we suddenly requiring more database connections? Are the number of connections to other services about to increase? Are we putting more load on a shared ESB (Enterprise Service Bus)? 3.) Have we measured how this sprint output affects lower environments systems incl. memory, connections etc.? Can we extrapolate lower environment effects to determine the affects on production? 4.) Can we measure how this sprint output is affected by load, latency or non-happy path use by testing in a lower environment? 5.) Are our lower environments accurate representations os set-up, OS configurations, plug-ins and libraries in Productions? 6.) Are third party or other internal services accurately represented in our lower environments so that we can observe the impact of the sprint output on those services? 7.) Are there new logging or instrumentation requirements that we need to account for with this sprint? 8.) Have we advised reliability team or DevOps team (if they perform reliability tasks) of any specific monitoring queries, dashboards or other Service Level Indicators (SLI) for this sprint output? 9.) Has the Product Owner determined a Service Level Objective (SLO) for the services in the sprint? Is the SLO attainable with the resources the new code will have in Production? Is there a similar service functioning in Production now that the product owner can use to estimate a realistic SLO expectation? 10.) Are outage, downtime, issues rules for new services produced by the sprint ready? Triggers sent to PagerDuty or a similar service? Instructions for remediation with triggers? Are thresholds set that align with the SLIs? I write every day for my work and projects. I have to write short-form, long-form and ultra-short for places like twitter and FB. Getting character and word counts right makes my editor's lives easier and helps me to estimate. if you like the sparse simplicity of writing in TextEdit then this short hack is for you. It should take about two minutes to set up. Drones, or unmanned aerial vehicles (UAVs), are playing an increasingly large role in businesses and private security in the U.S. Official drone training programs are cropping up at U.S. universities and in the private sector. What does the near future hold for drones and people that know how to operate them? All material is my own and does not reflect any opinions or materials of any employers or associated organizations. All material is licensed for use under the Creative Commons under BY-NC-ND.